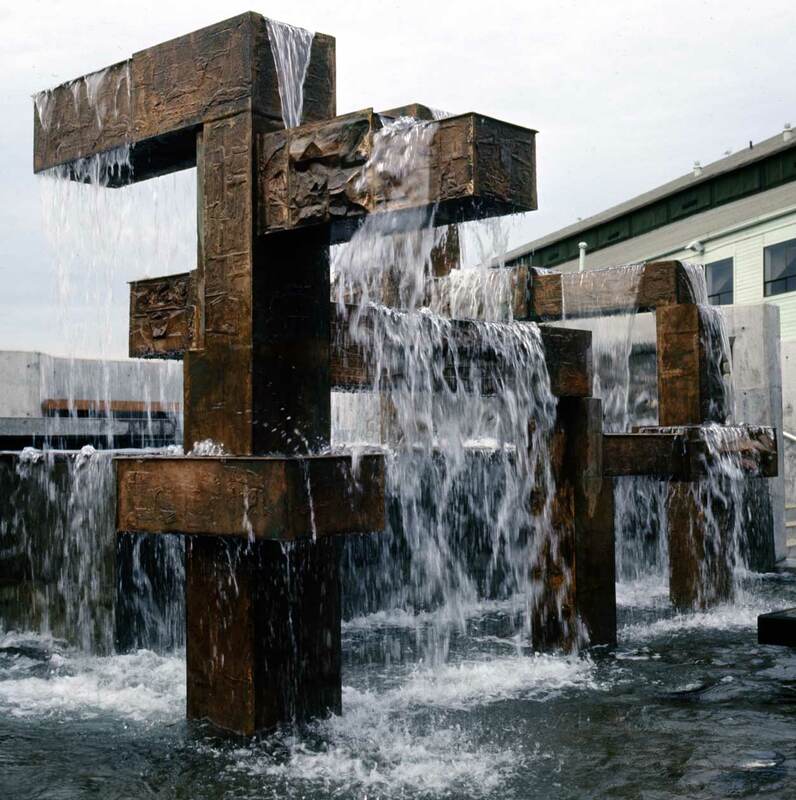 THEN: James FitzGerald's Waterfront Fountain was Helen Harrington Schiff's gift to the city in memory of her parents, Edward M. and Margaret J. Harrington. At 16-1/2 feet high and 21 feet long, the bronze fountain puts on a good show. NOW: Sherrard's repeat of Shaw's recording shows the fountain doing the fulfilling work of entertaining children. 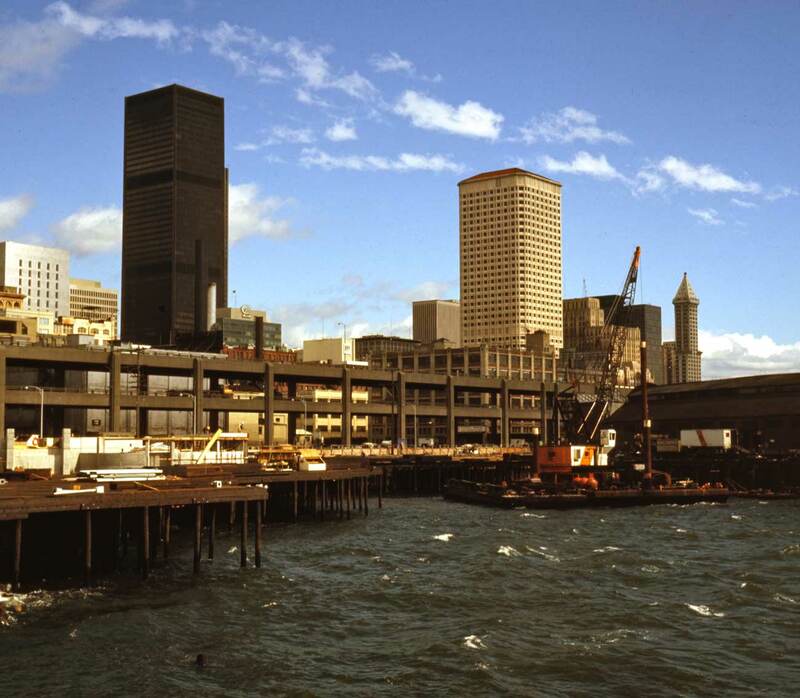 Certainly, many Pacific Northwest readers recall the construction in the mid-1970s of Waterfront Park and to the north of it the municipal aquarium. To help us remember, Frank Shaw photographed the entire process with his prized Hasselblad camera. 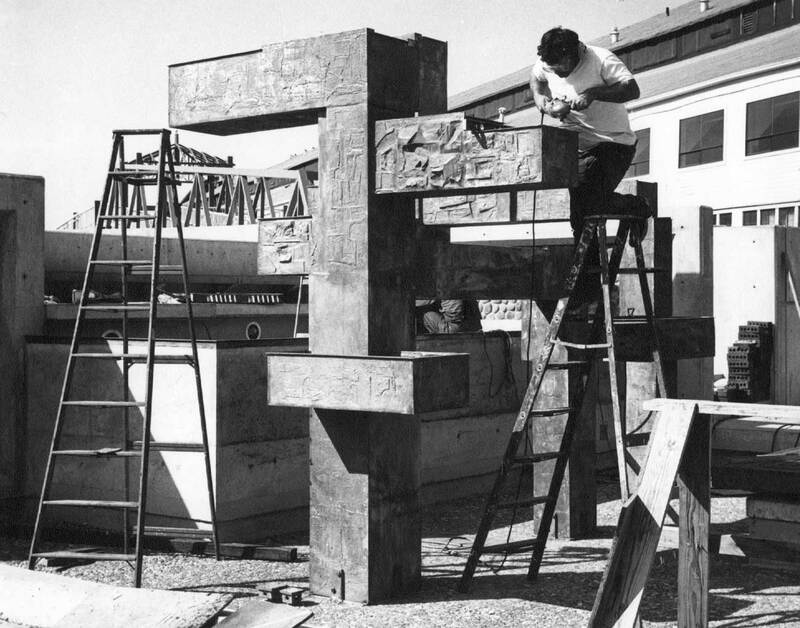 Because Shaw was good about dating his subjects, we know that this work on the Waterfront Fountain by Seattle sculptor James FitzGerald was nearing completion by Sept. 27, 1974. We also know that the man on the ladder applying finishing touches to that sculpture could not be FitzGerald, who died nearly a year earlier. 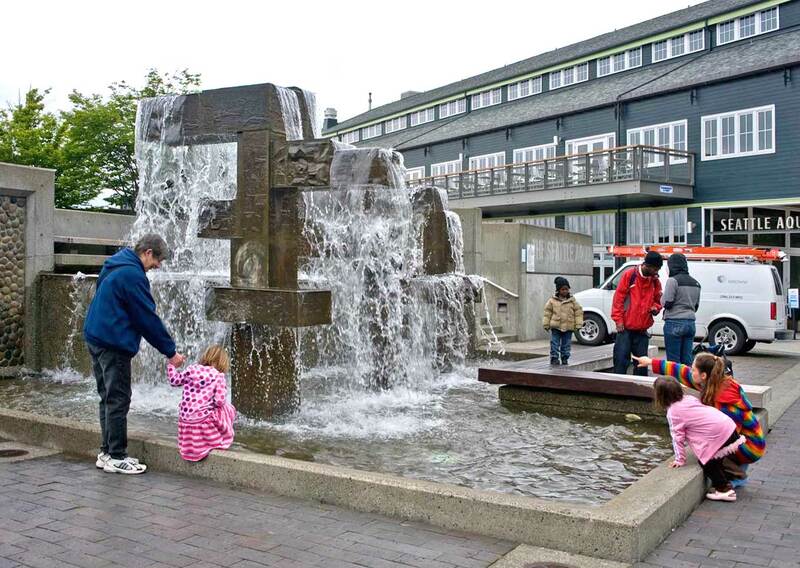 This waterworks was the last of five fountains that FitzGerald designed for public places in Seattle. His wife, Margaret Tomkins, also an artist, and his assistant, Terry Copple, completed it. Of course, I wondered if that was Copple on the ladder. An old friend, filmmaker Ken Levine, attended the fountain’s installation and was confident that FitzGerald’s daughter, Miro, was there as well. I had not seen Miro in a quarter century but Levine had her address, so I wrote, asked and she answered that it definitely is Terry Copple in the photo. He helped complete the casting and final finishing during a difficult time of grieving for her family, she said, adding that she had worked in a restaurant with Copple and introduced him to her dad. Jean, the tasks remaining in preparation for our – with Berangere – early April opening at MOHAI of the “Repeat Photography” show (the last exhibit, they say, in the museum’s old Montlake location) weighs heavy on my head and I must give my time to it. And yet there are some things to pull from some of the same past writing that was used to created the Pictorial History of the Seattle Waterfront, which is now up on this site as a pdf file. Until “nighty bear” time (we thank Bill Burden for that good night signal) we will slip a few things in that relate to the Pike wharf site. 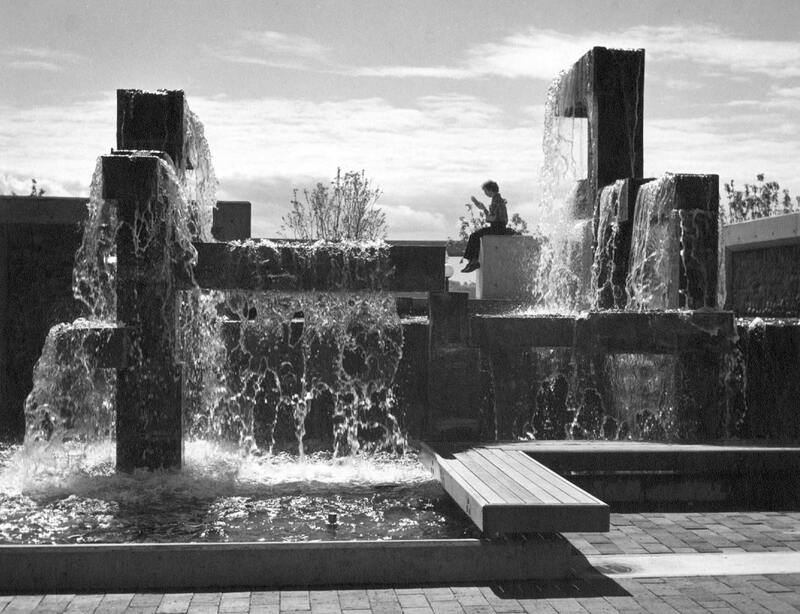 We’ll begin with a splendid slide that Frank Shaw took of the performing Fitzgerald fountain on November 26, 1974. Another of James Fitzgerald fountains in included in Shaw’s collection of colored slides and black-white negatives, most of them shot with his Hasselblad. 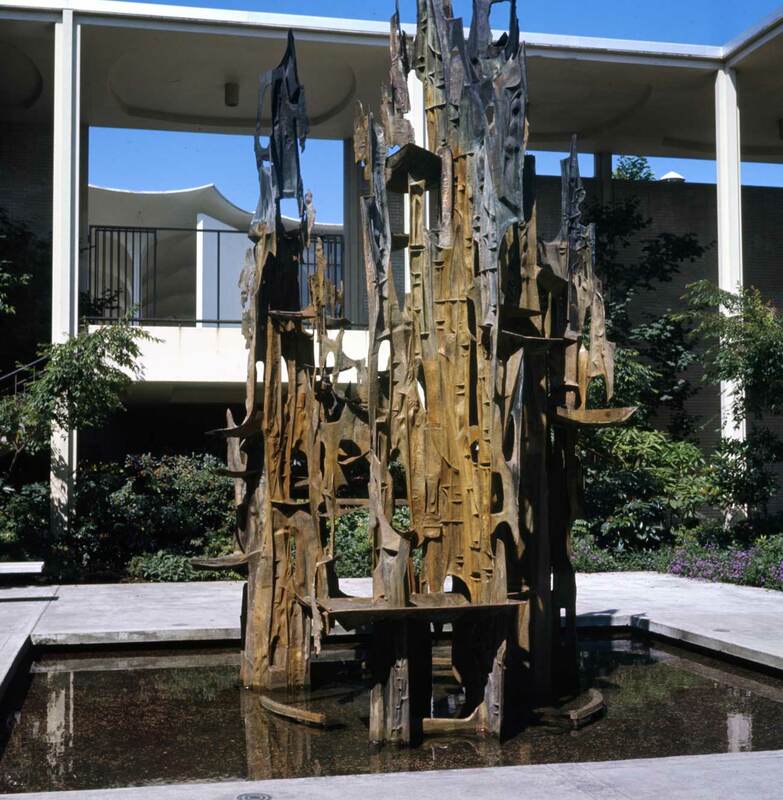 The sculptor’s Fountain of the Northwest was created for the city’s new playhouse in 1961, and was one of the artistic attractions of the 1962 Century 21 held there. Fitzgerald – and others – like this one so much that he made two of them. The other is on the Princeton University Campus, a kind of fountain of the northeast. 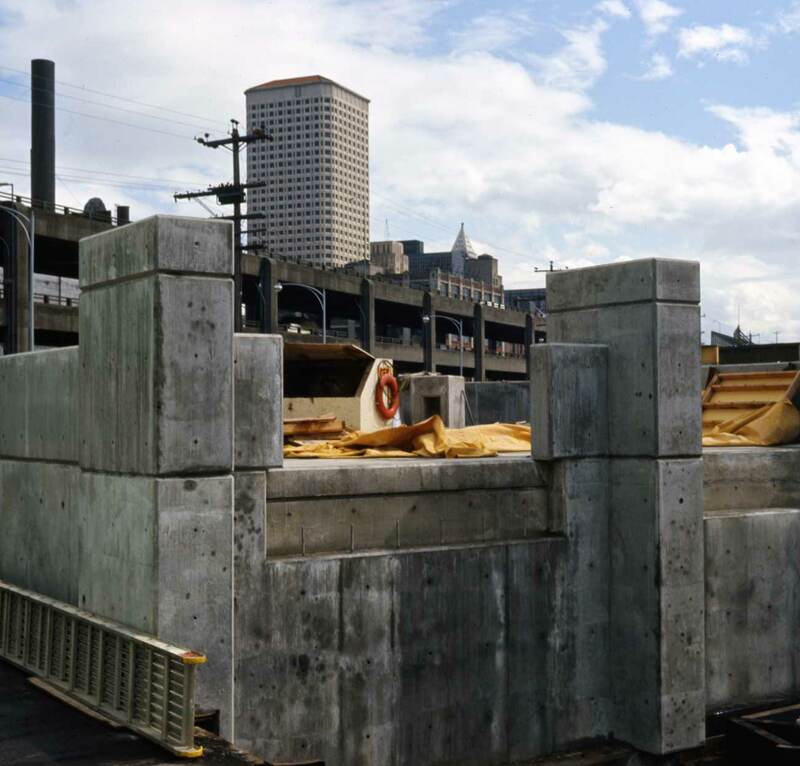 We’ll follow now with more of Shaw’s recordings of the Waterfront Park, during its construction with 1968 “forward thrust” funds – belatedly – and after its completion. 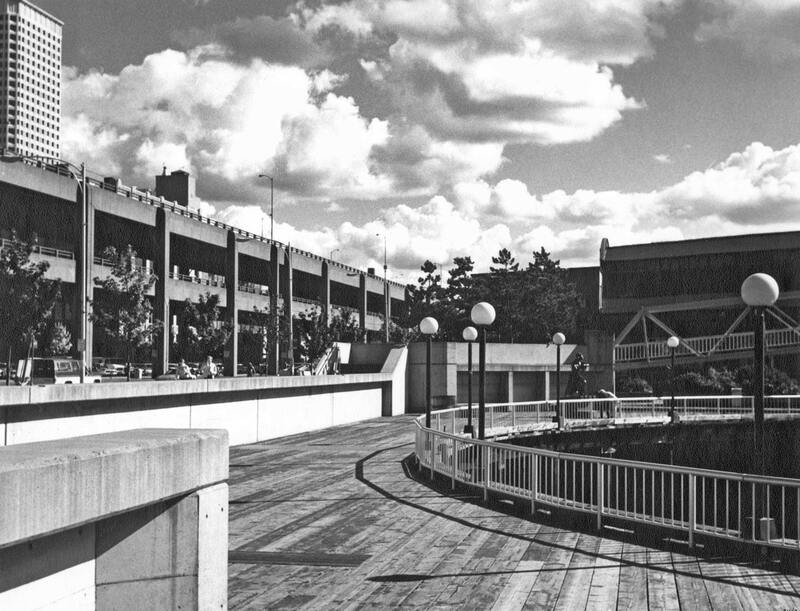 We will not include his many photographs of the building of the waterfront aquarium. We’ll save those for another time when we are less taxed. In anticipation looking thru the open water between Piers 57 and 59 on May 1, 1973. This "hole" in the waterfront was once held by the prosperous Schwabacher Wharf. 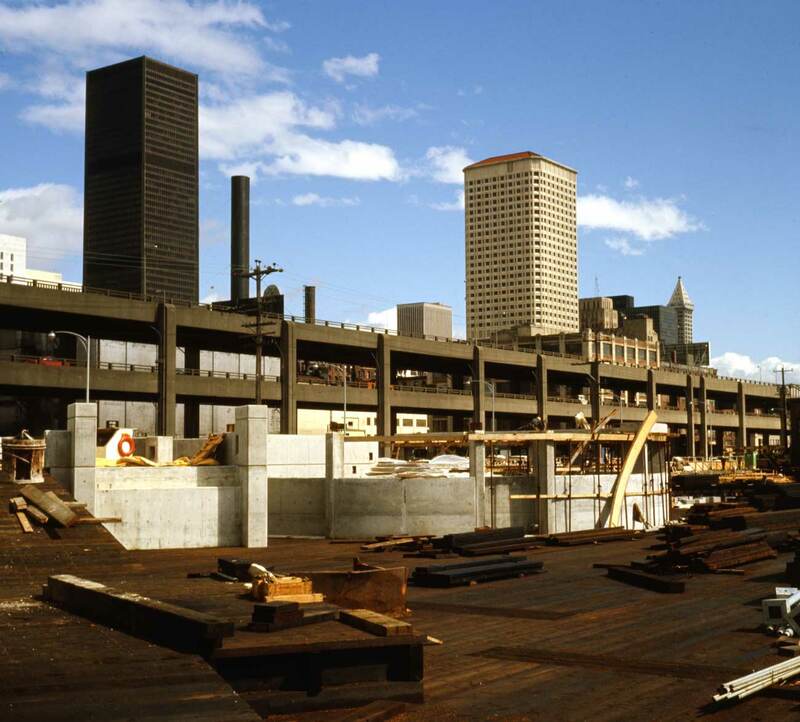 Note that the Federal Building on the right is still exposed with its skeleton, knowing perhaps, that it will not receive the brick skin that its architect intended for it. The SeaFirst tower is on the left. In the beginning, 1968, a symbol of its bank's ambition. But it is now surrounded and surmounted and the bank long since merged - or submerged - into a larger bank from beyond. Pile driving for the northern part of the park, where it nestles against the Pike Street Pier. For many years this was a harbor for the fishing fleet - part of it. Part of the fishing fleet moored in the slip on the south side of the Pike Pier. This is not a Shaw shot, but one much earlier. The pile driving continues to the south. November, 8, 1973.
. . . and further still. Jan. 2, 1974.
and continuing . . . Feb. 7, 1974. 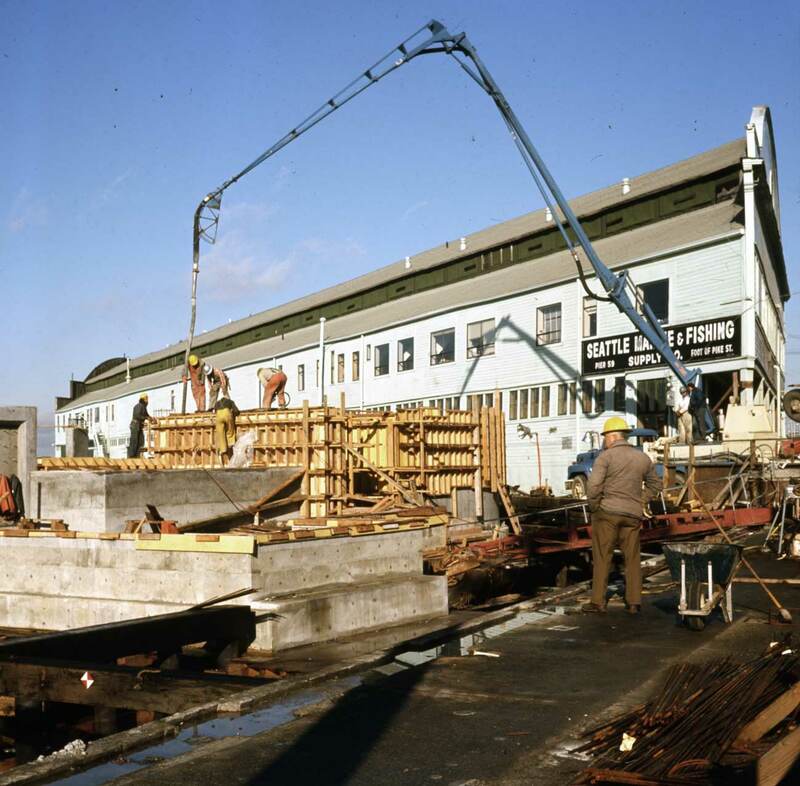 The earliest concrete forms, March 29, 1974. The Federal Building's substitute skin is also in place. Another Frank Shaw recording from April 11, 1974. The by now familiar curving forms of the park are taking shape. 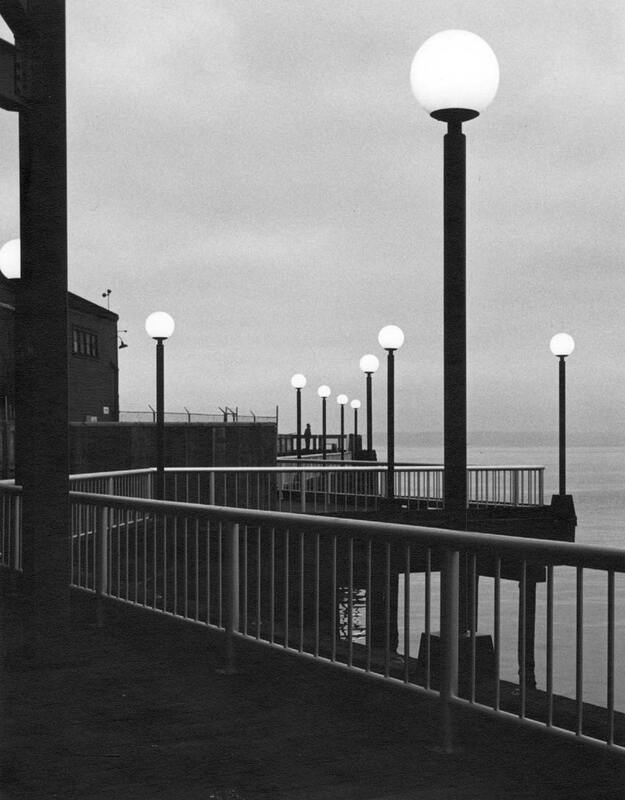 The lighting along the Pier 57 southern side of the park - Nov. 15, 1974. Looking south thru the park on Nov. 1, 1981. 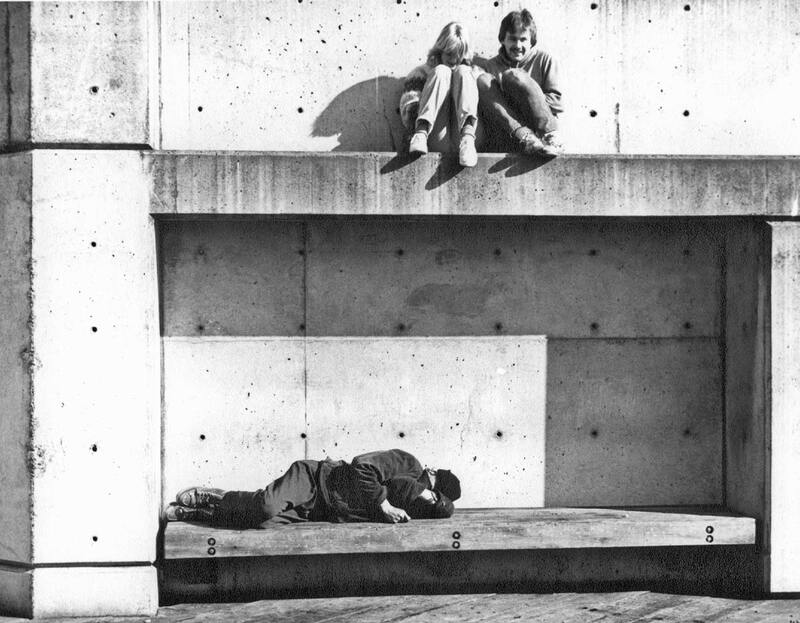 By March 3, 1984, ten years after the construction began, Waterfront Park had settled into its familiar uses. We will turn now to older subjects, but ones that are still linked to the waterfront neighborhood near the foot of Pike Street. First a look at the first structure built by the first settlers with California money to exploit the rich coal deposits on the east side of Lake Washington. 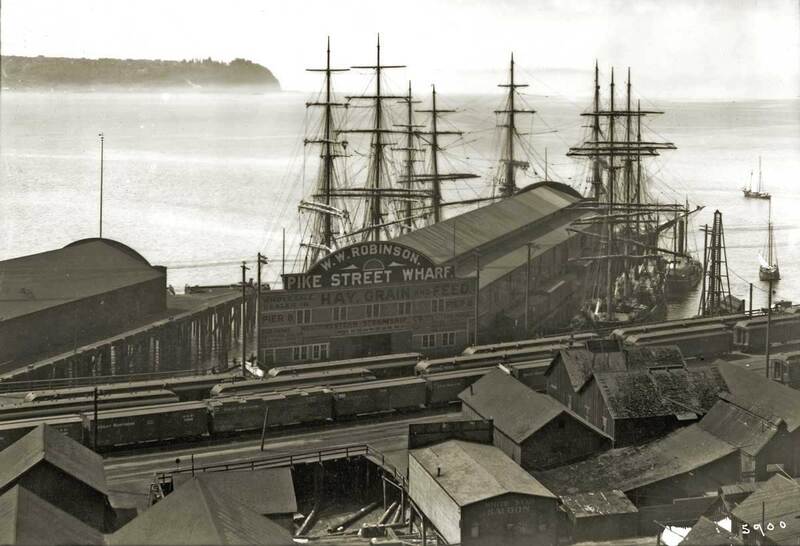 When it was new in 1871, the Pike Street Pier and Coal Wharf competed with Yesler’s Wharf as the biggest structure in town. First we see it from the back of the Peterson & Bros photography studio at the waterfront foot of Cherry Street. 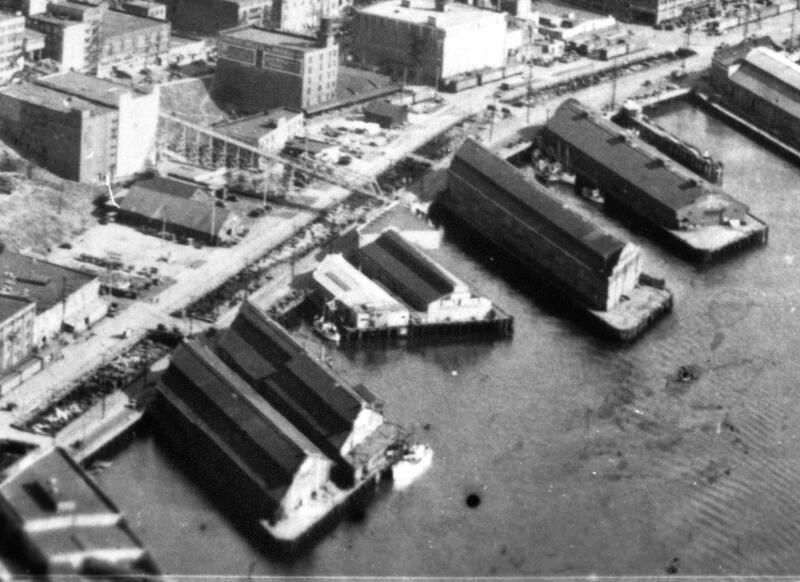 The Pike Street Wharf and coal bunkers above the roof crest of a small warehouse build on pilings near the foot of Columbia Street. The wreck of a schooner is the Winward, which is famous for being still there, buried beneath Western Avenue near Columbia. This view dates from 1876. 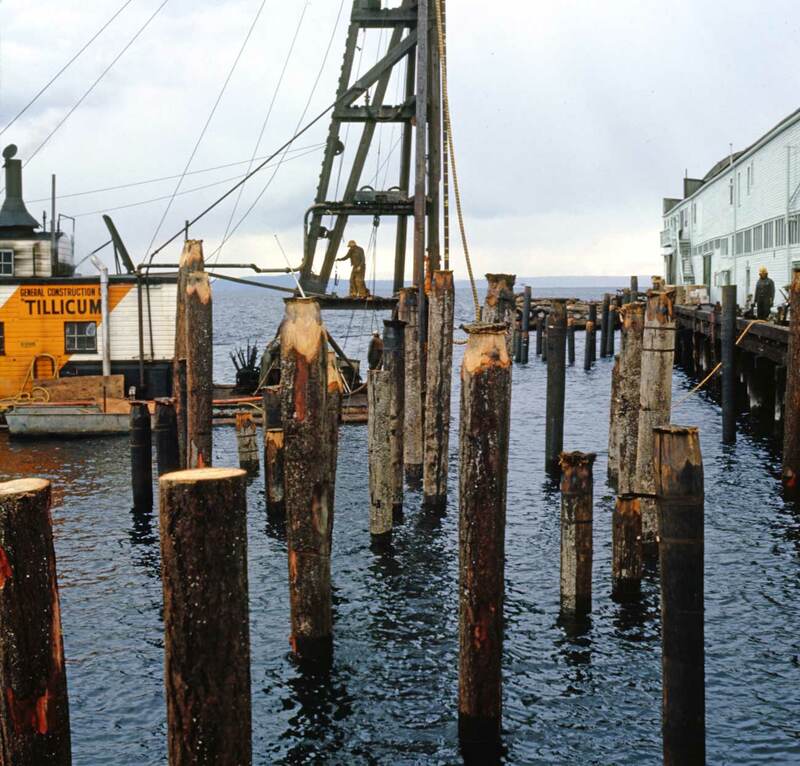 In two years more the Pike Pier was abandoned for a new coal wharf off of King Street. It's connection to the coal fields of Renton, and Newcastle was more direct around the south end of Lake Washington. 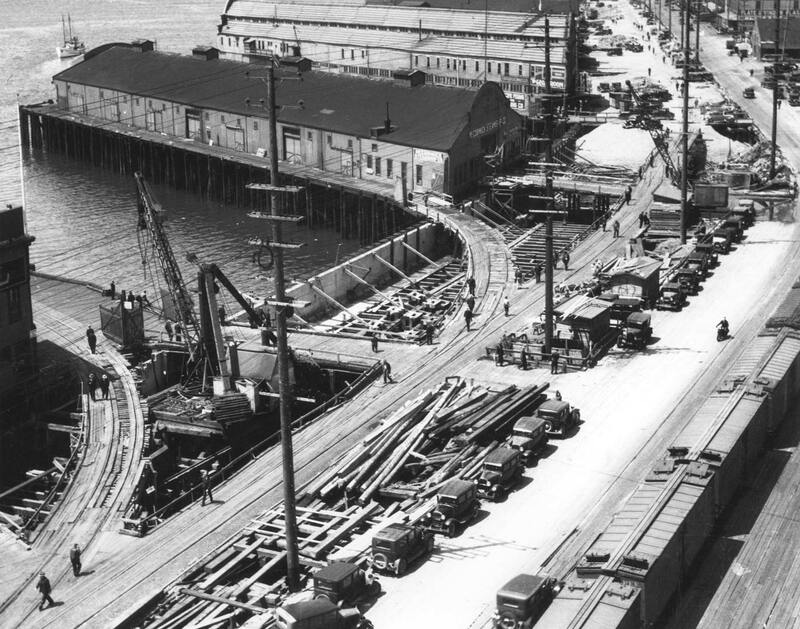 Detail from the above of the Pike Coal Pier and its hillclimb to the location now of the Pike Place Market. 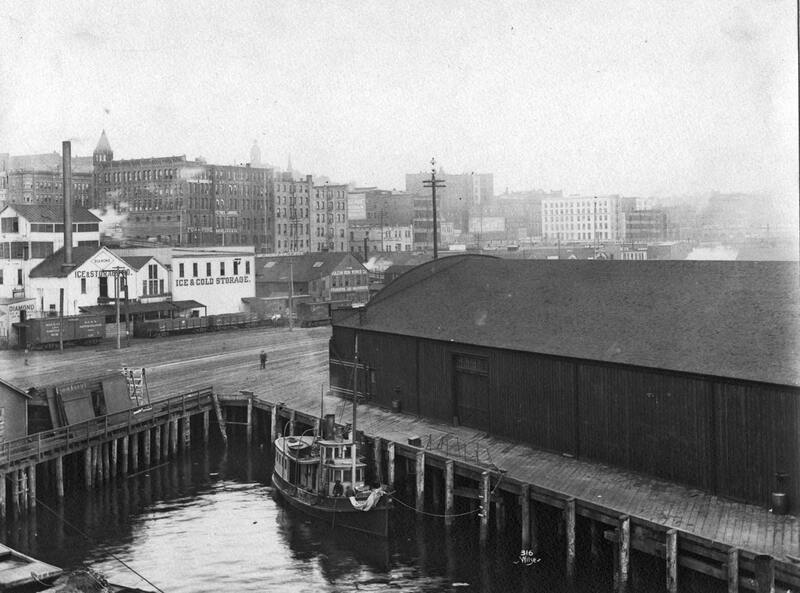 The Pike Pier as it appears in Seattle's 1878 Birdseye. Here the ruins of the Pike Wharf are recorded from the King Street Wharf that replaced it. This detail is part of a sweeping panorama of the waterfront recorded, most likely, in 1881. Denny Hill is in the foreground, and Queen Anne Hill on the horizon. 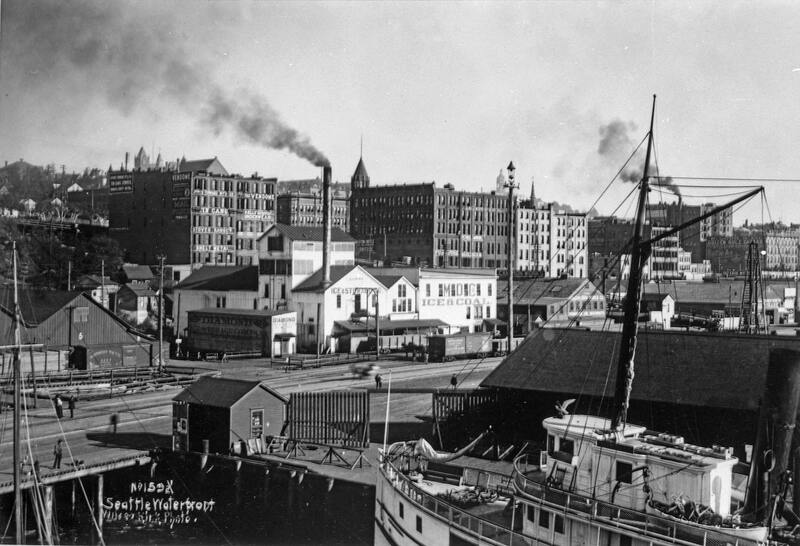 From the bluff above the waterfront Anders Wilse recorded this wide look at the waterfront in the late 1890s. 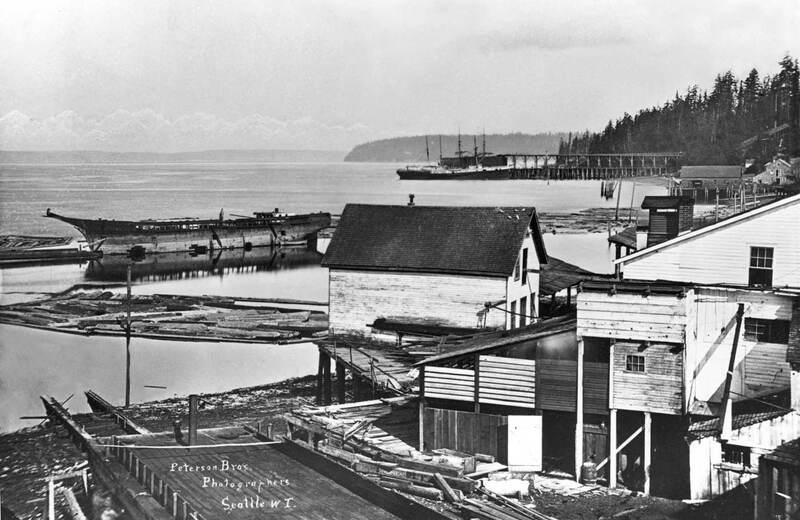 The old Schwabacher Pier on the right figured in the two most celebrated visits to Seattle in the 1890s: first the inaugural service of a Japanese shipping line, and second the 1897 return of the Portland from Alaska with its now long since legendary "ton of gold." MIIKE MARU Aug 31, 1896. After a sustained recession of three years following the economic crash of 1893, locals were alive to anything that might indicate a return to the three years of prosperity that followed the city’s Great Fire of 1889. Nothing before the arrival of the gold rush ship Portland the following year seemed so promising as the appearance of the Japanese liner Miike Maru at Schwabacher wharf on Aug, 31, 1896. It marked the beginning of a direct and regular service to Japan that since this beginning has only been interrupted by war. The steamer arrived at 3 o’clock in the afternoon amid a welcoming uproar of factory whistles. 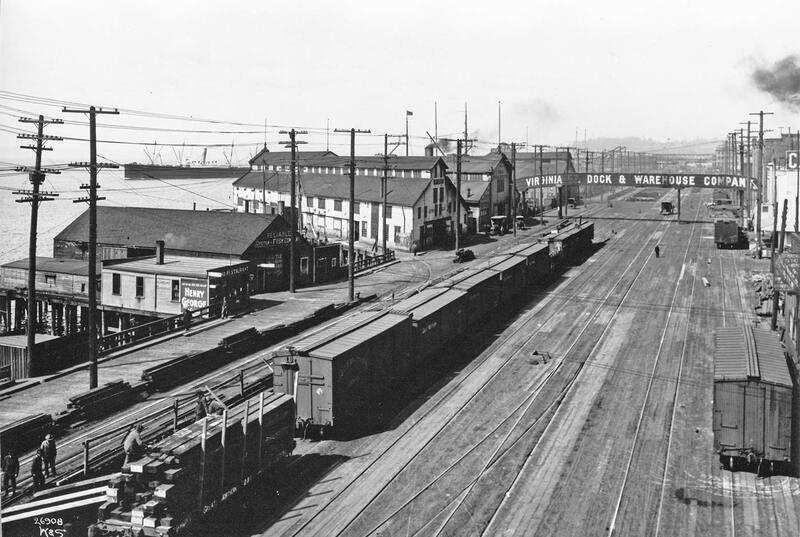 The Schwabacher Dock served as the terminal of this new service until it was moved at the turn of the century two piers south to Frank Waterhouse’s Arlington Dock or Pier 5 and still later to “Empire Builder” James J. Hill’s Great Northern docks at Smith Cove. This view looks north from near the foot of Seneca Street. The fanciful construction of the Clark and Bartette boathouse is evident on the far right. 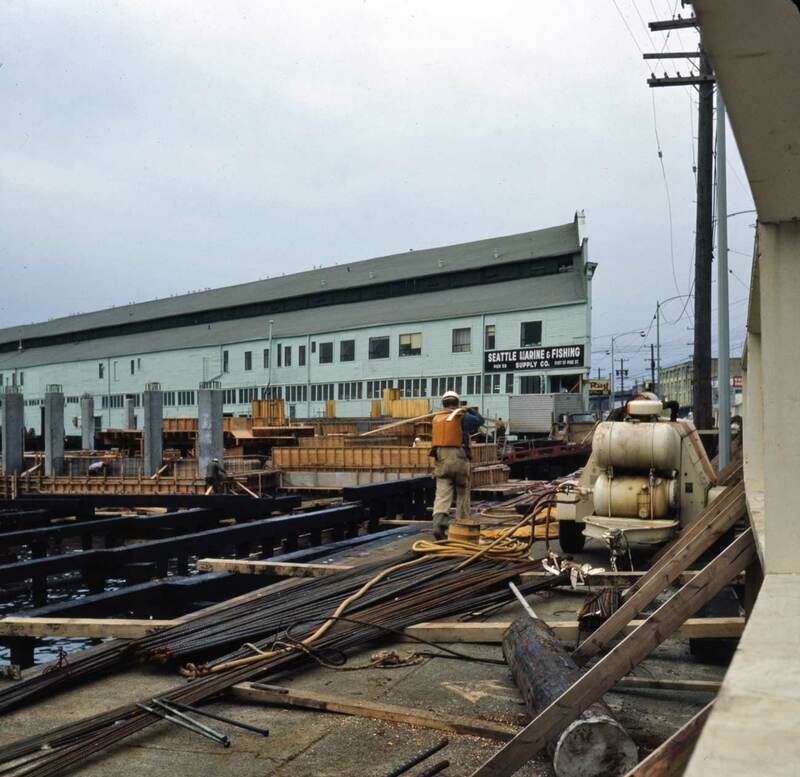 The Schwabacher pier shed that shows to the far side of the Miike Maru is a transitional structure between post-89fire sheds and the 1899 warehouse, long familiar on the waterfront. The top-most roofline (with two small vents) of the Ainsworth and Dunn’s Seattle Fish Company dock at the foot of Pike Street shows just above the Schwabacher roofline. Looking north thru the open water made with the razing of the last Schwabacher Warf and the 1974-74 raising of the Waterfront Park. 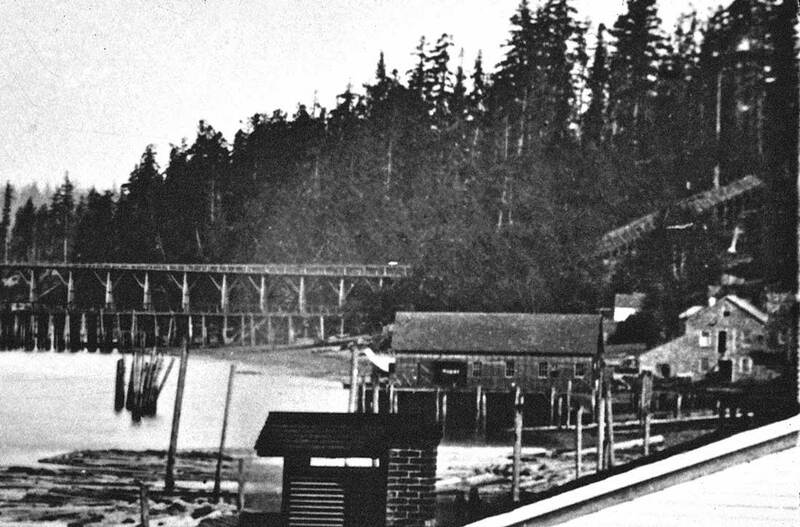 Schwabacher Pier from the surviving Seattle Lake Shore and Eastern Railway (left) and "Ram's Horn Railway" (right) tracks after the city's "great fire" of 1889. The view looks north with the fire's ruins to the rear of the photographer. With University Street and the ruins behind the photographer the above view looks north to Schwabacher’s wharf not long after the June 6, 1889 fire. The photographer stands on the Rams Horn trestle – the Seattle Lake Shore and Eastern trestle is on the left. A box car is used as a wall on the Rams Horn. It is nailed in place. 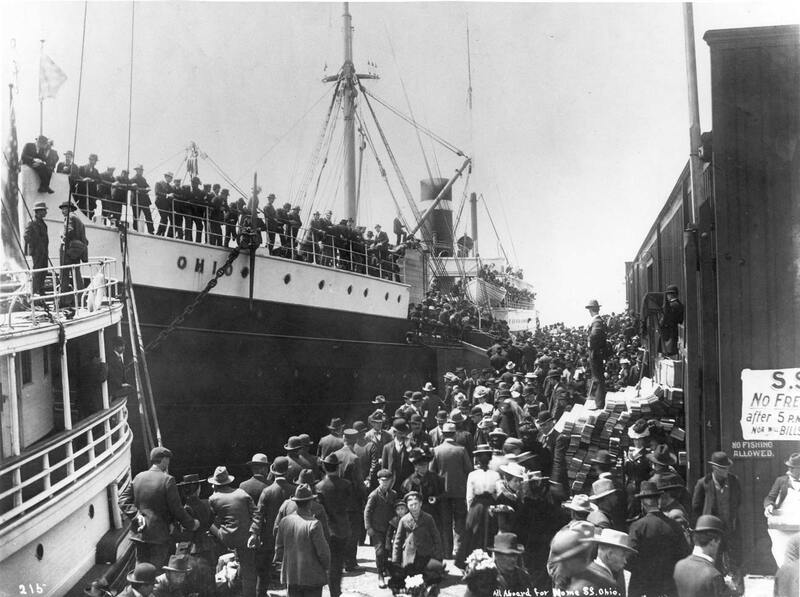 No arrival on the Seattle waterfront created such a sustained stir as the sixty-eight passengers who disembarked from the steamer Portland carrying bags of gold dust onto the Schwabacher Wharf. (above) The crowd that gathered on the wharf at six in the morning knew they were coming because a Post-Intelligencer reporter earlier chartered a tug to meet the Portland as she entered Puget Sound. Returning quickly with the story the P-I’s “Ton of Gold” issue came out about the time the Portland came in. Within ten days 1,500 locals had fled the city for the Yukon. The best sign of the Seattle hysteria came from its mayor, W. D. Wood. Visiting in San Francisco he wired home his resignation and headed much further north than his home on Green Lake. It is probably impossible to determine at what point in the Portland’s short stay that this view of it resting in a low tide between the Schwabacher and Seattle Fish Co. wharves was photographed. A portion of the Schwabacher pier shed appears on the far right. There is plenty of room on the apron to build a bigger warehouse, and here for the curious to visit a scene they sensed was historic even at the time. 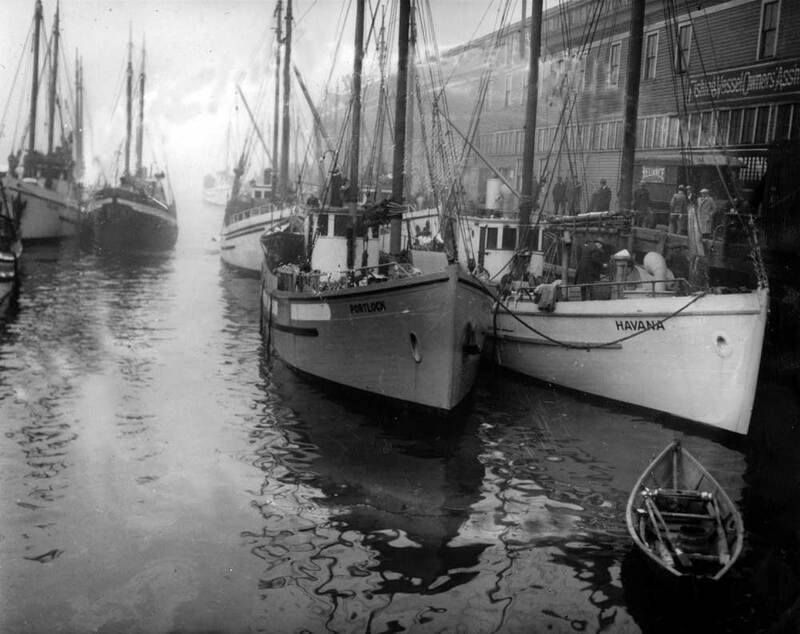 The “color” of the waterfront in the post-Portland months – and years – is captured in the somewhat gaudy prose of a 25th anniversary commemorative article in The Seattle Times from July 16, 1922. 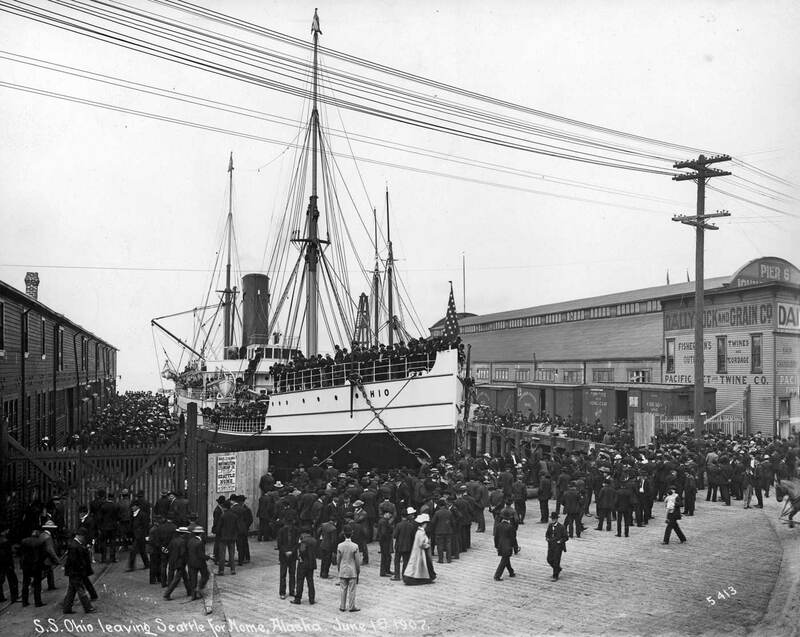 “Arrival of the gold ship Portland in July 1897 launched Seattle on one of the most thrilling and picturesque epochs in her shipping history . 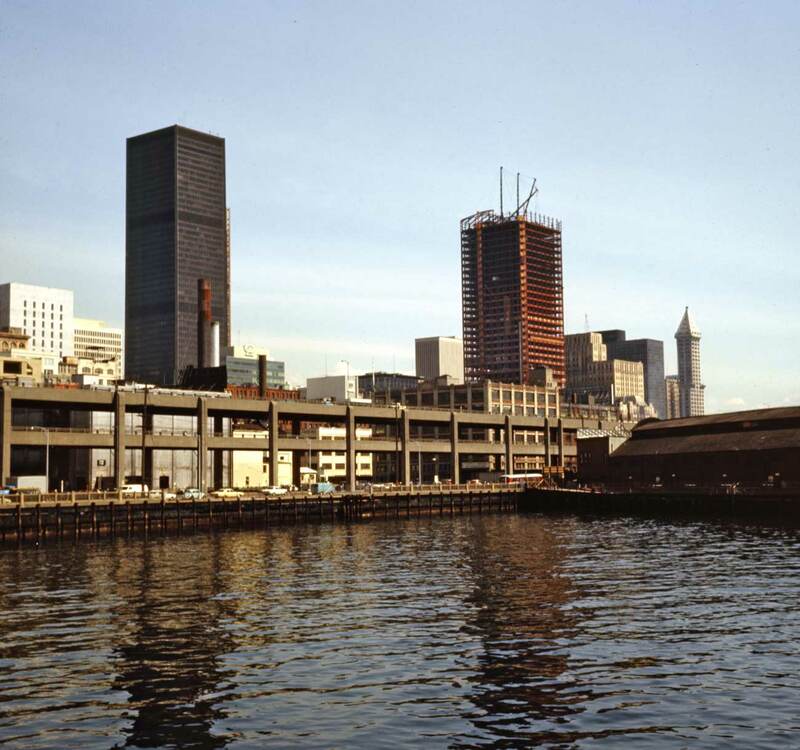 . . in a few months transformed Elliott Bay from a moderately active harbor into a strenuous and crowded shipping center . . . In a comparatively few months Seattle was able to boast that she could handle 15,000 men to Alaska every thirty days and she made good the boast with characteristic decisiveness . . . Up to Feb 1898 the first class fare to Skagway and Dyoea was $40. It was then raised to $50 and the second class fare was increased from $25 to $35. In announcing the increase in rates, Seattle newspapers used the headline, ‘Rates Go Sky High.’ In April, however, the fares dropped to $10. The following Sept brought another drop, the first class fare falling to $25. The stampeders who poured into Seattle the first winter 1897-98 had an inspiring war cry, ‘Klondike or bust, march the fust.’ By Feb 1898 the movement had grown to gigantic proportions and Seattle steamships were shooting back and forth as fast as their engines could drive them. There were thirty-two scheduled sailings from Elliott Bay in Feb., l39 in March and 36 in April or 107 sailings in 99 days. Thousands of Argonauts poured into the city from all over the world each week and other thousands departed at the same time for the Golden North. 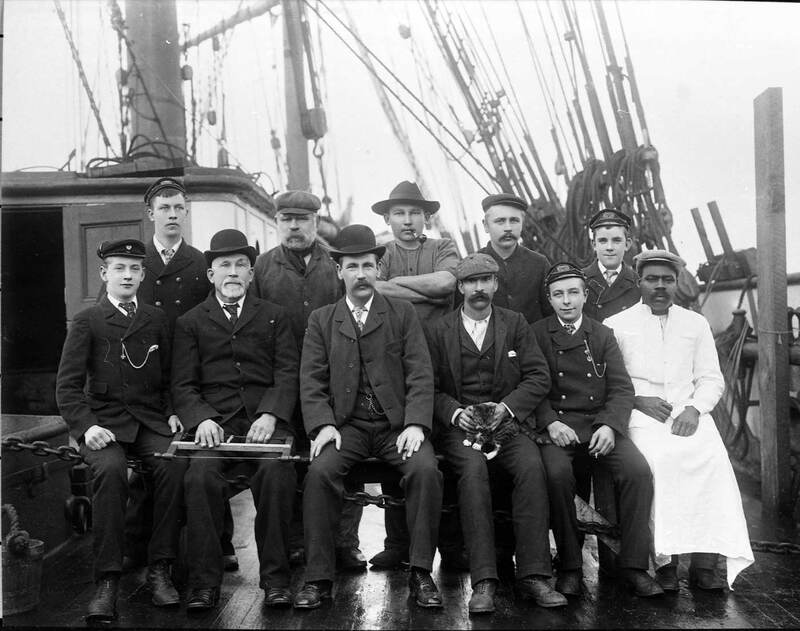 A typical William Hester portrait of a ship's crew - and a typical crew too. Written across the base of the subject above is it’s own helpful caption. It reads, “S.S. Ohio Leaving Seattle for Nome Alaska, June 1st 1907.” A broadside or poster tacked to the slab fence between the crowd and the ship promises “Fast and Improved Steam Ships between Seattle and Nome, Frequent and Regular Sailings.” A year later the White Star Steamship’s Ohio left Seattle for Nome also on the first of June. So it was regular. It was also unlucky. In the 1907 sailing the Ohio struck an iceberg in the Bering Sea and 75 panicked passengers jumped overboard to the ice. Four perished before they could be returned to the ship that was not sinking. In 1908 the Ohio’s captain was careful to the extreme, infuriating many of its passengers who missed what they imaged were their best Nome chances while the ship waited for the ice to melt. In one year more the Ohio hit an uncharted rock in Swanson’s Bay, B.C. but the captain managed to make a run to shore and all but four of the 214 on board survived before the 360 foot-long steamship slipped away. When it was new in 1873, the Ohio was the largest vessel built in the U.S.
We may wonder at the size of the crowd here – far too many than can fit on the Ohio. Obviously the embarking of a vessel to Alaska even towards the end of the Yukon-Alaska gold rush era was enough excitement to bring out spectators in pants. Judging by their hats, caps and bonnets practically everyone of these figures – excepting the women in the light-colored frock, center-bottom – are men in the uniform of the day: dark suits. 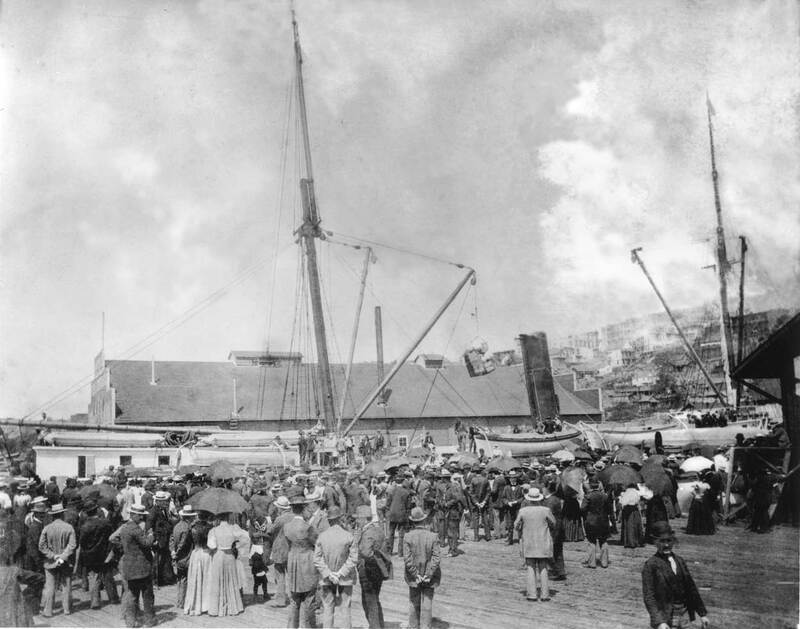 The truth is that going to Nome in 1907 – or ten years after the local excitement connected with the Yukon-Alaska gold rush era began with the 1897 arrival of the S.S. Portland and its “ton of gold” – was still ordinarily a “manly affair”, meaning that many and perhaps most of those on board were still hoping to get rich quick on or near the beaches of Nome by some combination of sweat and luck. There remain a few more subject to put in line here and, no doubt, many mistakes to proof. I’ll return to them after a late breakfast. Now I’m away – I repeat – to Nighty Bears, that wonderfully silly cave of sweet dreams. I’m back, kind of, at 12:30 Sunday afternoon. First here is another look at the Ohio, a close-up from the southeast corner of the Schwabacher Wharf. A "now" that is by now several years old. I joined two landscape digital records - top and bottom - imperfectly. The sky, at least, is intact. The next subject looks back at this prospect, or in line with it. 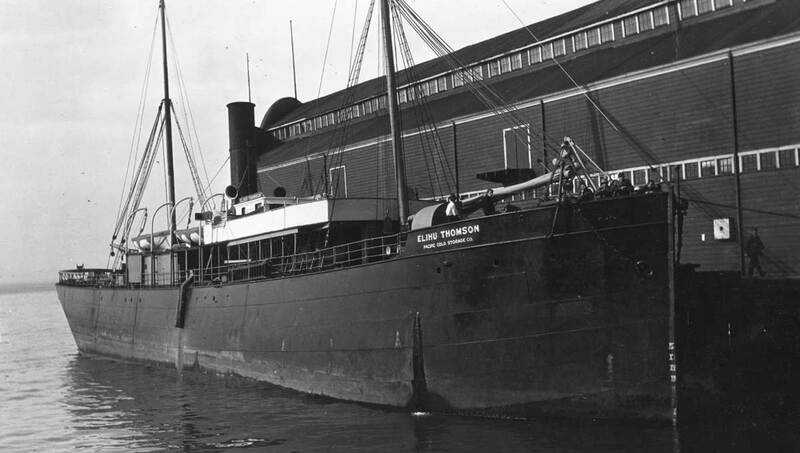 Looking back from Railroad Avenue to the end of the Pike Pier with the steamer Eihu Thomson in between. She must have stories to tell. But we will neglect them for this moment. As the gold rush stirred in the Schwabacher slip it also climbed to the pier. Encouraged by the wealth got in part from warehousing and wharf rates the already venerable firm built a much larger warehouse on its wharf. 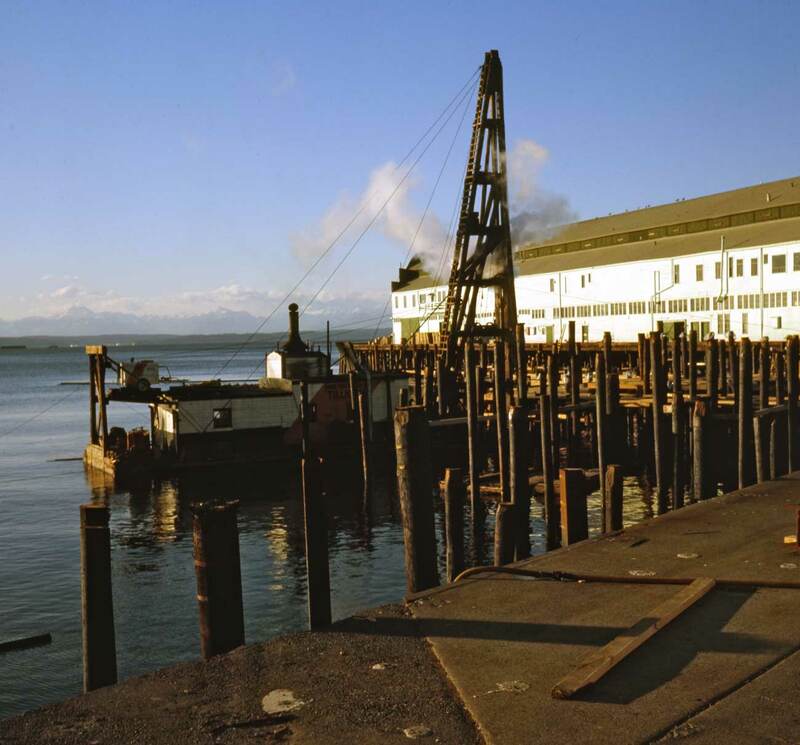 Two photographs by Norwegian photographer Anders Wilse from the same position on the roof of the Seattle Fish Company Wharf (Pier 8/59) record the big changes on the neighboring Schwabacher pier. Both views look southeast over Railroad Avenue to the varied rooflines of the Diamond Ice plant and the hotels on First Avenue. The conical tower of the Arlington Hotel (the old Gilmore block) surmounts the intersection of First and University Street from its southwest corner. In the above view a small structure appears lower-left at the northeast corner of the Schwabacher Wharf. Above it is the rear (west) wall of the Vendome Hotel on First Avenue. A portion of the same small structure appears on the far left of the later Wilse view, below. 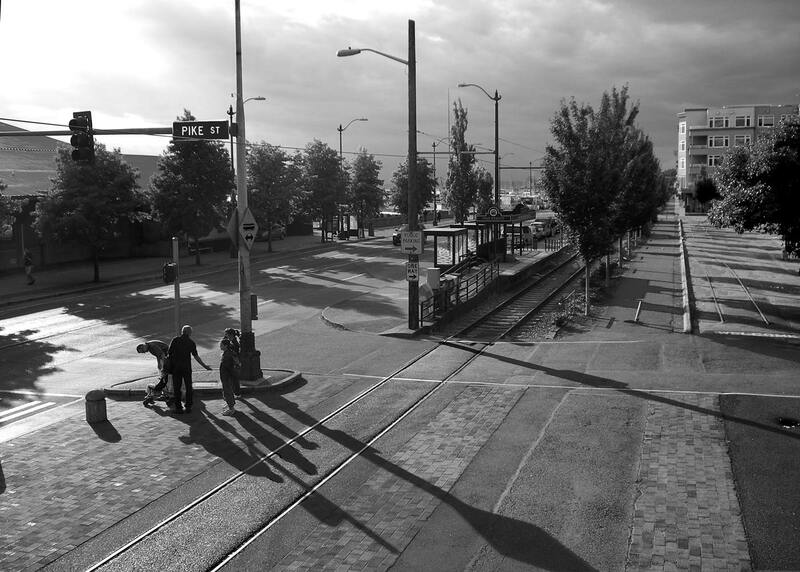 Although it holds the same position (one point in a triangulation when the photographer’s prospect is considered) with the structures across Railroad Avenue, it has been separated from the Schwabacher wharf which has been reconfigured about ten yards to the south. The north wall of the much larger pier shed (it fills most of left half of the frame) stands about ten feet south of the crest of the roof in the old shed that appears on the right of the earlier photograph. 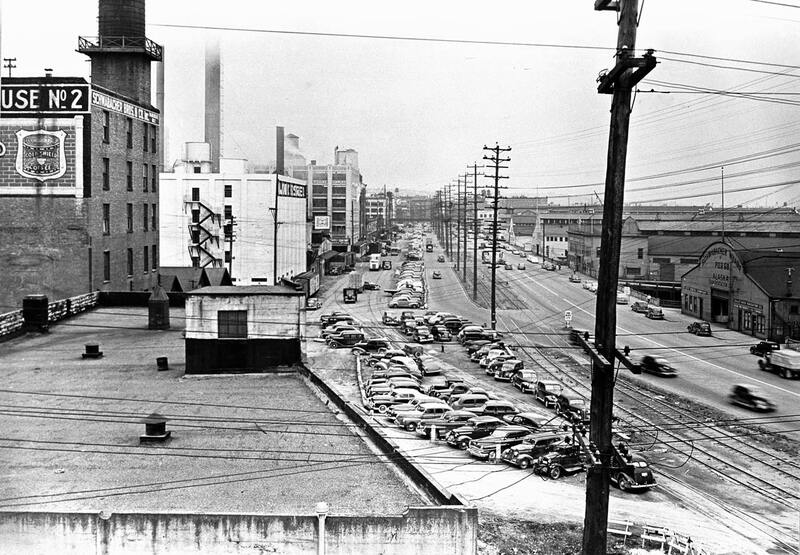 Another and later Wilse view (below) looks back at both the Schwabacher Wharf and the Seattle Fish Wharf from the back of the First Avenue hotel row between Seneca and University Streets. 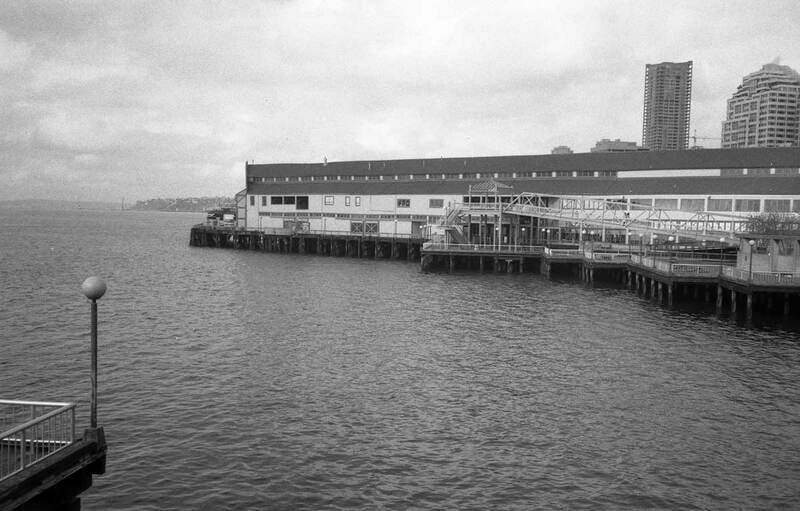 The view reveals the considerable size of the penultimate but short-lived Ainsworth and Dunn’s Seattle Fish Co. pier (8/59), as well the first photographic evidence for wharf structures (8&1/2 — 60-61) built north of it between Pike and Pine streets on the site of the future municipal aquarium. 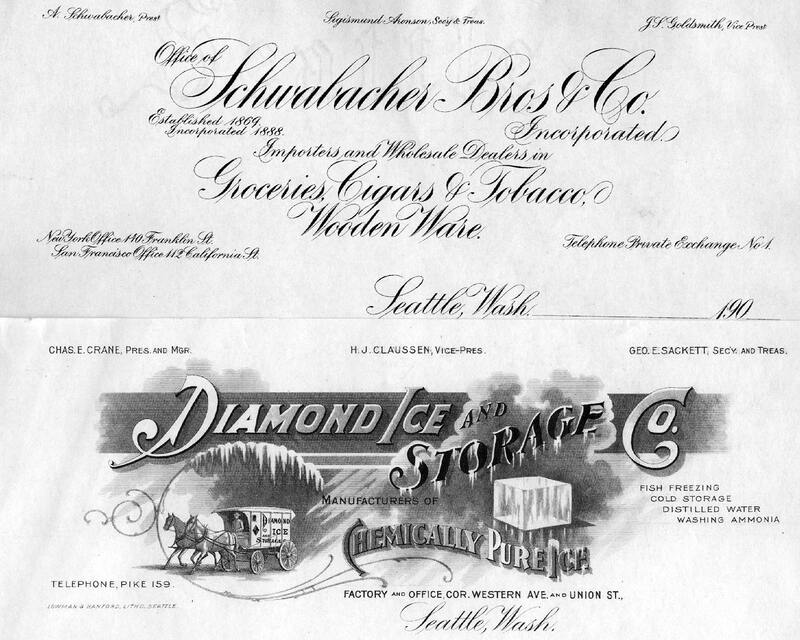 Turn of the century (from 19th to 20th) ephemera from Schwabacher on top, and "chemically pure" Diamond Ice, above. 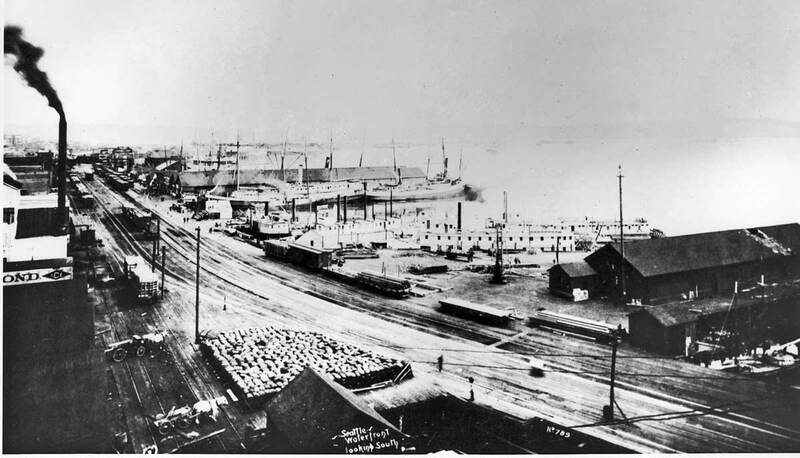 An early look down from the bluff upon the new Pike Street Wharf as home for its first primary tenant, the hay and grain dealer W. W. Robinson. Willis Wilbur Robinson was born in Kansas in 1871 and came to Mount Vernon in 1890 where he had success as a farmer and learned the wholesale trade in hay and feed. 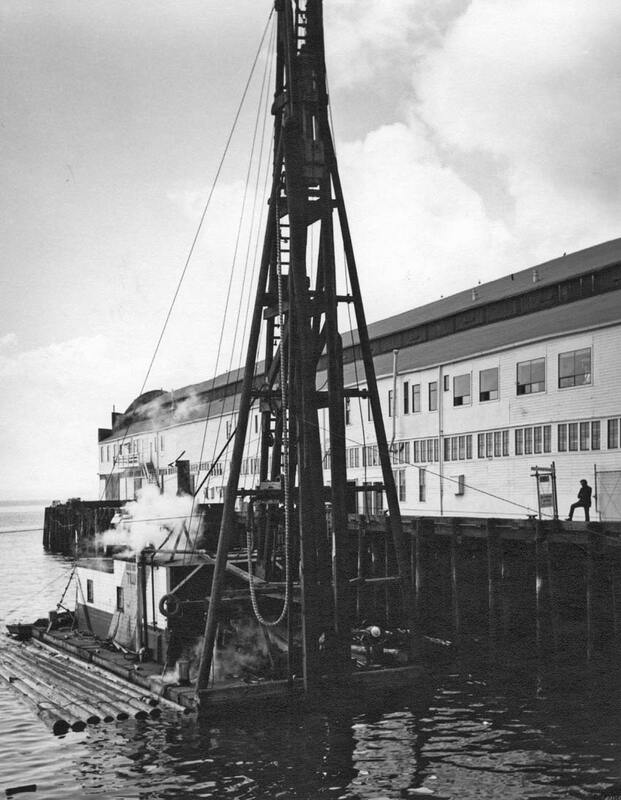 He is first listed as operating at the Pike Street Wharf in the 1905 city directory. 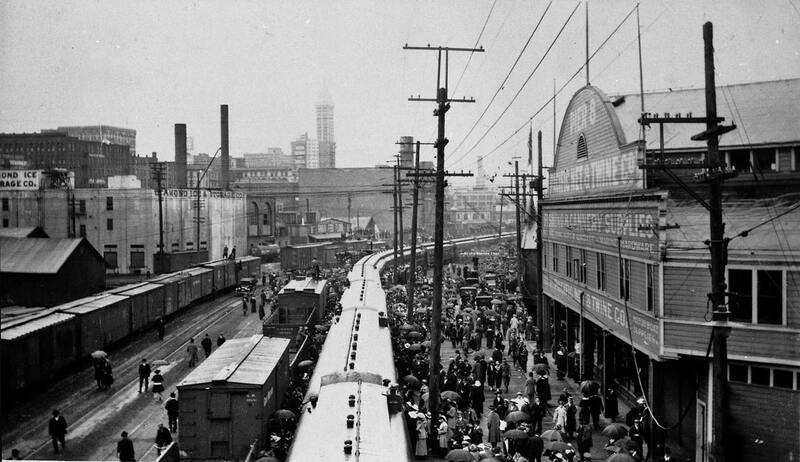 His stay at the foot of Pike Street last until about 1909 when he moved his operations to the new reclaimed industrial area south of Pioneer Square. Before the railroads took charge of moving commodities like Robinson’s hay, stern-wheeler steamers capable of reaching up the Puget Sound tributaries like the Skagit River, on which Robinson’s farm was located, handled most of it. We have dated this aerial ca. 1934, because the 1934-36 seawall construction between Madison and Bay streets is "at hand." Part of pier 57 shows upper-right. First below it is a dock (of sorts) for the Wellington Coal Co. 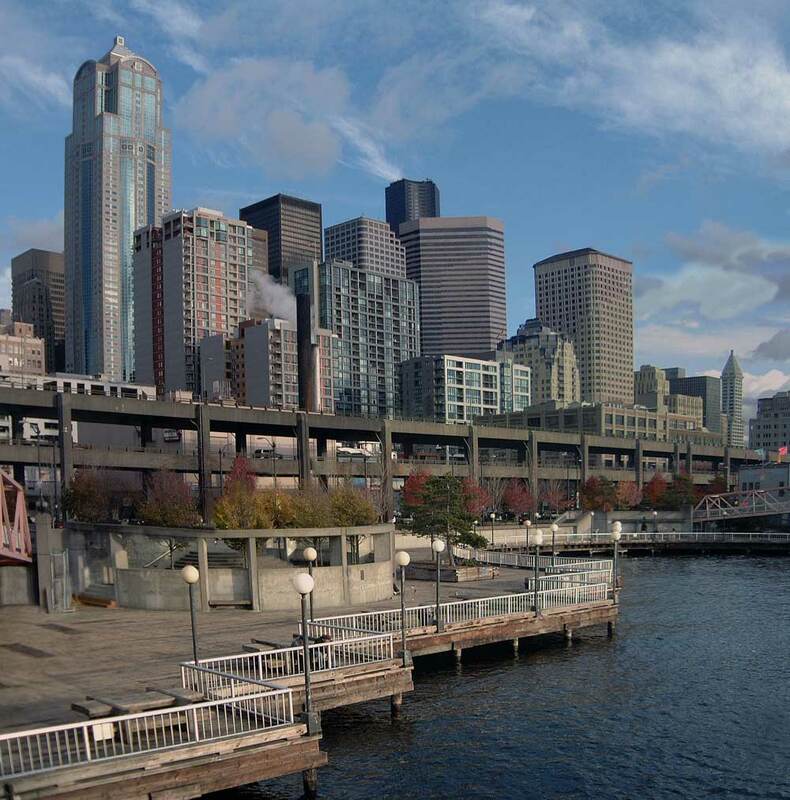 This is followed by the Schwabacher Pier and it by the Pike St. Pier. At the center are two small "fish piers" (now the site of the aquarium), followed by the Gaffney Pier, which is huddled with its partner the Virginia Street pier that gave most of its life transshipping newsprint for the local papers and and other printers. 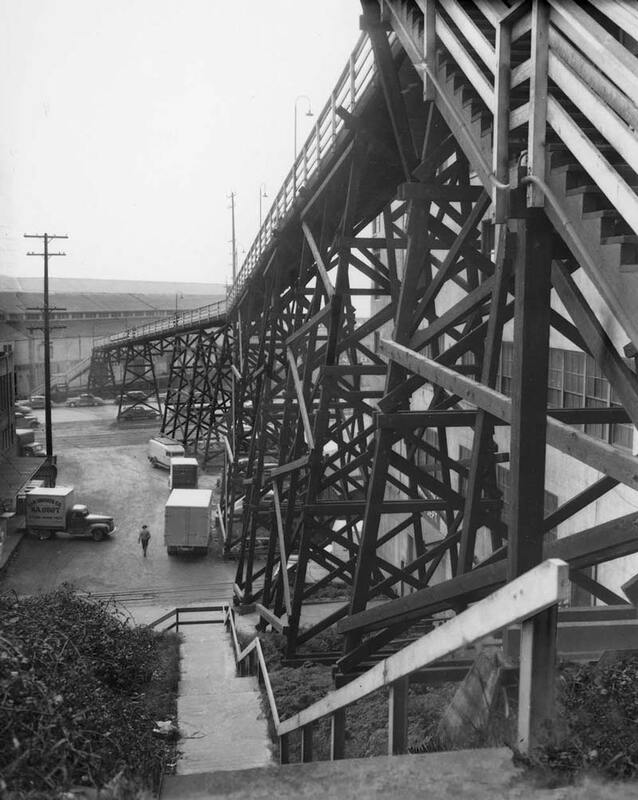 The Pike Street trestle descends from the Market to the slip just north of the Pike Street Pier. We will follow this scene with several photographs taken from the viaduct, a few to the north and a few to the south. First to the north. Railroad Avenue north from the Pike Street Overpass, ca. 1912. On the left, the combination of a small café and the Reliable Oyster & Fish Company hold what was earlier the San Juan Fish Company pier. Just north are the familiar Gaffney and Virginia Street docks and the latter’s viaduct across Railroad Avenue. 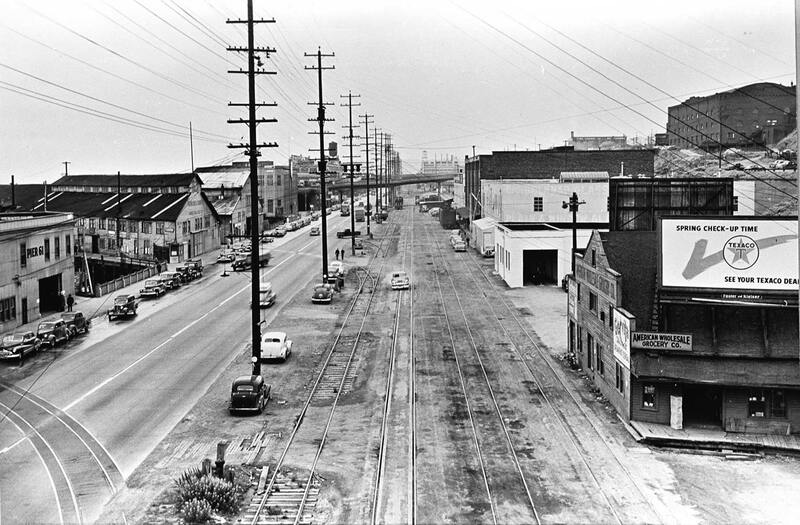 A later look north from the Pike Street Trestle. At this time public workers are preparing to build the Alaska Way Viaduct, which we are now preparing to tear down. Jean's recent repeat, using his extension pole the high reach of his 6''7" frame. 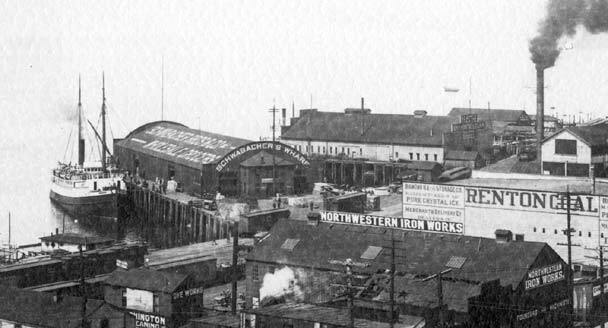 Looking north from the viaduct in the late teens - I figure. 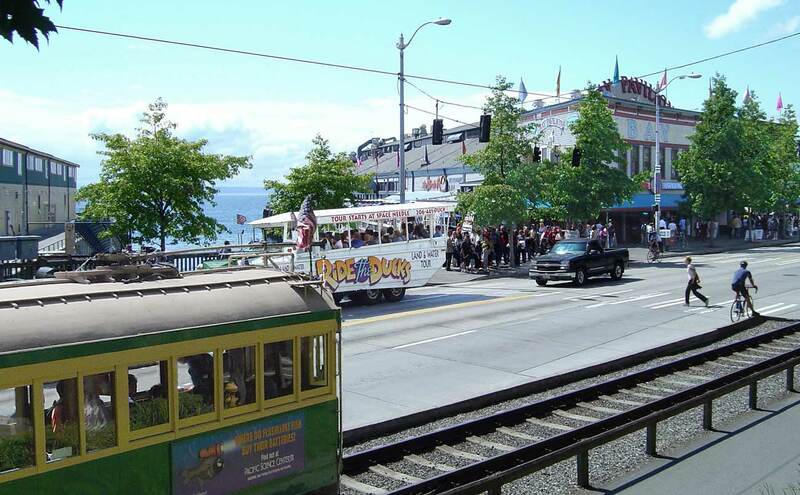 The Pike Street Pier is on the right. 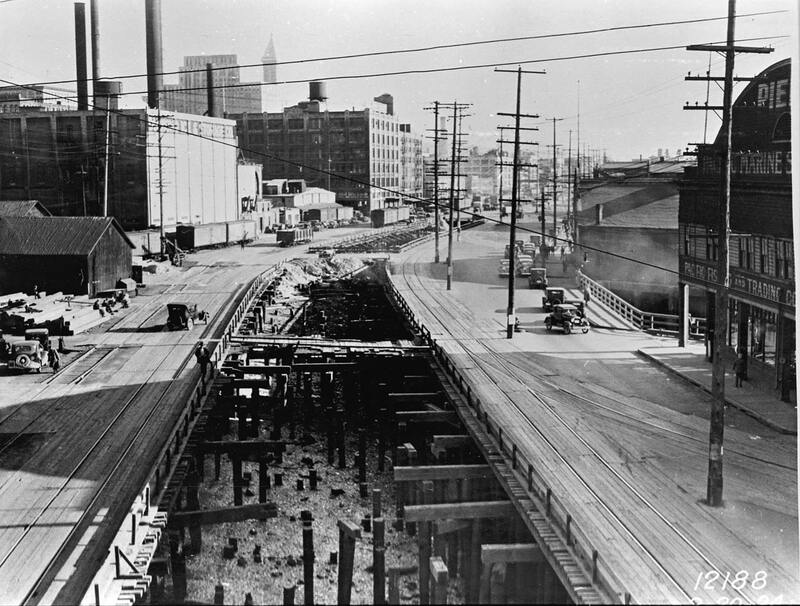 Moments before the first 1934 work on the Railroad Avenue seawall north from Madison to Bay Street. The Pike Street wharf is on the right, here home to volunteer and professional organizations - and businesses - having to do, for the most part, with fishing. The gaping hole in Railroad Avenue reveals the tideflat below the trestle. These were called, by some, "man traps" for a few did fall or drive into them. Another of the Post-WW2 waterfront survey photos. 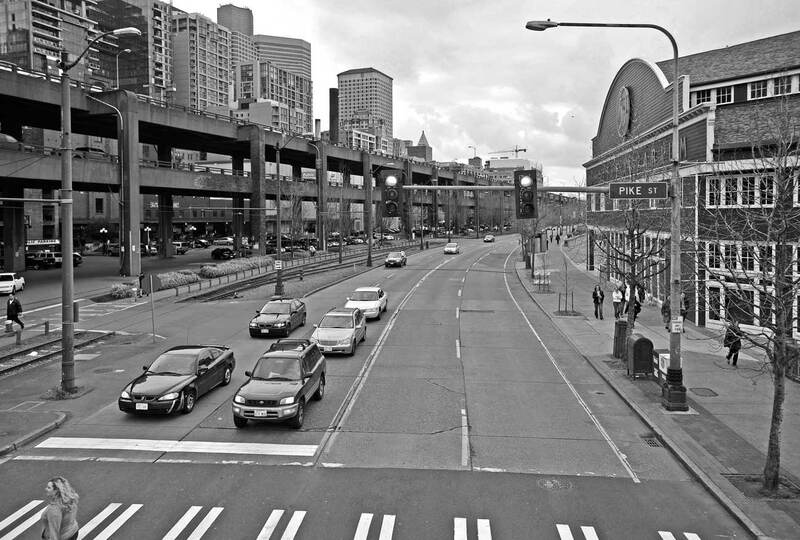 This one looks south from the Pike Street Viaduct in line with the future Alaska Way Viaduct, which the photographer, we imagine, was imagining. Jean's look south with his pole from the line of the old Pike Street Waterfront Trestle. The Pike Street Watefront Trestle seen looking west from Western Avenue below it. Here the trestle is in its last days before being torn town for the construction of the Alaska Way Viaduct. Courtesy, Museum of History and Industry. The CATALA in her slip beside the last remaining part of the Schwabacher dock. It served as a boatel during the 1962 Century 21. 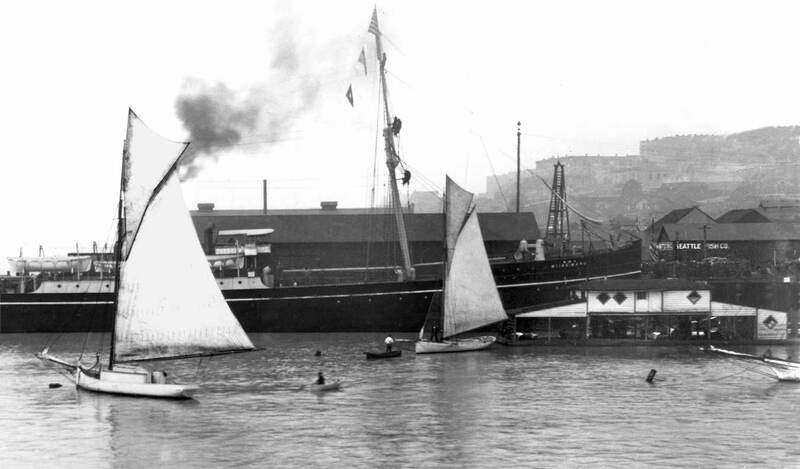 As the “Queen” of the Union Steamship Fleet the Catala was a tramp steamer dressed in a formal. For nearly 35 years her pointed bow was eagerly greeted at the logging camps, canneries and isolated villages between Vancouver and Prince Rupert, British Columbia. Here she rests on the Seattle Waterfront waving the Stars and Strips as a sign of a new service that was also a rescue. 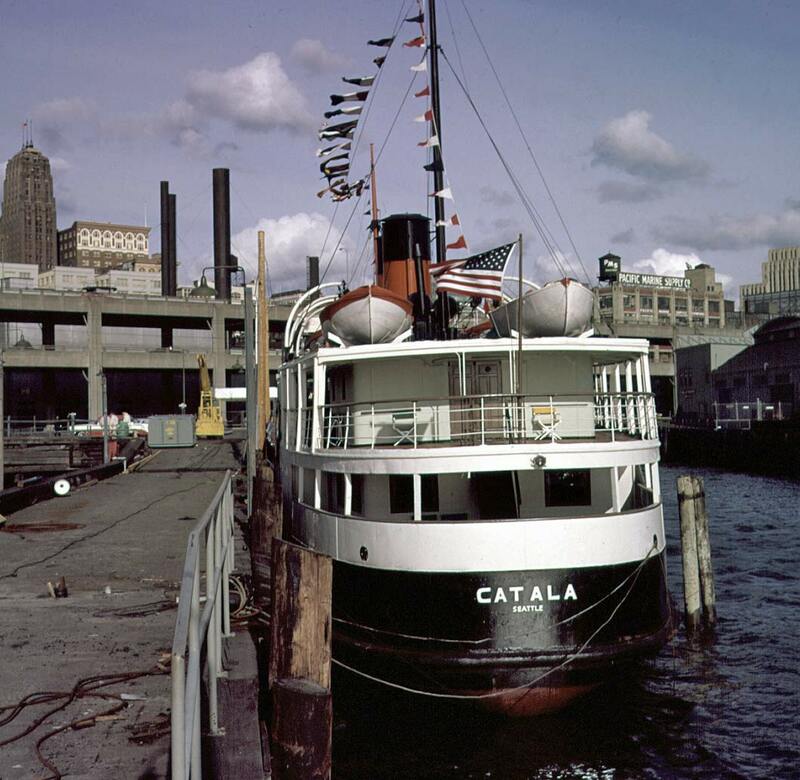 Headed for scrap in 1959 the Catala was instead gussied-up to perform as a “boatel” on Seattle’s waterfront during 1962 Century 21. Along with the 682-foot-long Dominion Monarch and the 537-foot-long Acapulco the 253-foot Catala was the smallest of three liners outfitted to serve as hotel ships during the worlds fair. According to Gene Woodwick, the vessels sympathetic chronicler, the Catala was also the only one to make a profit and stay for the duration of the fair. 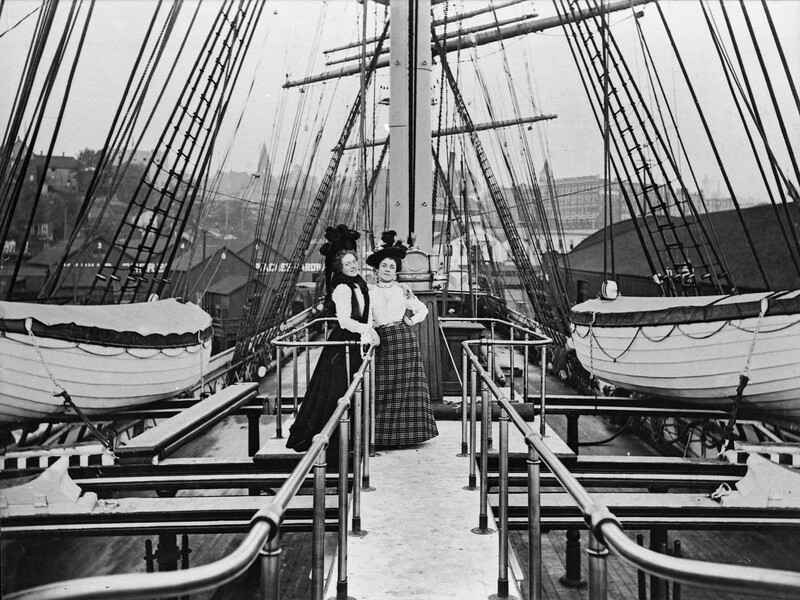 The steamer was already familiar to Canadians and many of the guests that enjoyed her plush quarters during the fair were the loggers, fishers and shore-huggers who had once ridden her. Built in 1925 in Montrose, Scotland her last stop in 1963 was at Ocean Shores where she was set up again as a “boatel” with 52 staterooms, a restaurant and lounge, but this time for fishers. During the night of New Years Eve, 1965, the Catala was driven ashore by 70 mph winds. Picked by scavengers and salvagers she remained a picturesque wreck until bulldozed over. Gene Woodwick (She is also the director of the Ocean Shores Interpretative Center.) is pleased to note that on New Years Eve 2001 – thirty-five years after blown ashore – another storm exposed the keel and remaining ribbing of the Catala, which then resumed her very last service as a maritime relic. If you have a Catala story (or photograph) to share, Gene Woodwick would love to hear from you. You can contact her thru this blog with a reply. THE END OF THIS FEATURE – for now (and then). 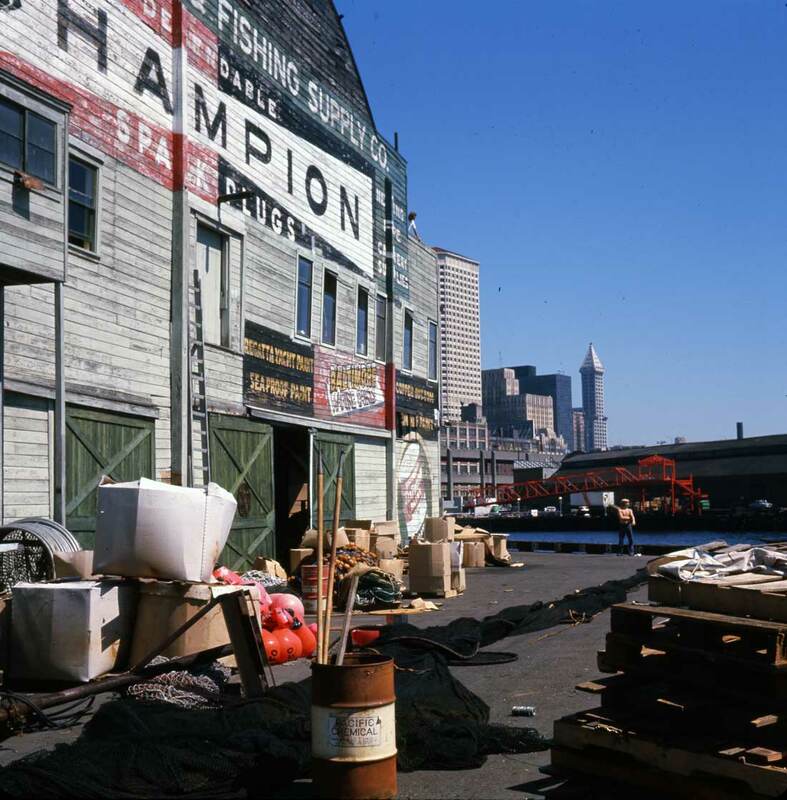 Frank Shaw's mid-70s recording of the colorful west end of the Pike Pier, the face it showed to fishing boats for many years.